As the year 2019 opens, it appears as though the process of obtaining and maintaining a Thai or American visa will be more difficult compared to years past. Although certain aspects of each process may involve increased laxity, flexibility, or efficiency the overall theme from immigration authorities in the United States and Thailand would seem to be one of heightened scrutiny and increasingly stringent enforcement measures. Some facets of the US visa process look to be improving. For example, the Department of State through the National Visa Center and various Embassies and Consulates abroad are becoming more efficient by shifting away from paper documentation over to a new digitized interface allowing faster processing of supporting documentation for immigrant and non-immigrant visa applications. This blogger can say from personal experience that the new system still has some issues to be worked out, but the overall system would suggest that faster processing times at NVC are likely to be a mainstay in the future. That stated, the overall process of obtaining a US visa would appear to be getting more difficult especially in light of the current administration’s addition of a National Vetting Center tasked with adding scrutiny to the overall adjudication of visa petitions. Meanwhile, policy changes regarding adjudication of visa applications are likely to have substantial impact upon the amount of denials which are issued by USCIS in coming years. A memorandum which came into effect in September of 2018 allows officers of the United States Citizenship and Immigration Service to deny visa petitions much more easily compared to times past when a Request For Evidence generally had to be issued before a denial. These developments coupled with creation of bodies such as the DeNaturalization task force and the prospect of a prolonged government shutdown would suggest that matters pertaining to American immigration are likely to prove more difficult moving forward. Meanwhile, as the United States’ Immigration apparatus becomes more cumbersome, Immigration authorities in Thailand do not seem to be backing down from their position regarding immigration and immigration enforcement in the Kingdom. In the lead up to 2019, the overarching policy of “Good Guys in Bad Guys Out” (a policy of encouraging lawful visitors and immigrants to the Kingdom while attempting to discourage travelers with more nefarious motives) manifested itself in terms of enforcement with “Operation X-Ray Outlaw Foreigner“. By the end of 2018 Surachate “Big Joke” Hakparn had announced that tens of thousand of illegal aliens had been arrested, deported, and blacklisted from returning to Thailand. In December of 2018 further statements would suggest that although a great number of visa violators have been precluded from remaining in Thailand, the Immigration office’s vigilance will not decrease. Concurrently, the process of obtaining extensions of Thai retirement visas and Thai marriage visas are likely to become more difficult for some people as it will no longer be possible to obtain an income affidavit for such extensions. This comes at the same time as immigration authorities make comments that would indicate prospective increased scrutiny on those using visa services to obtain retirement and marriage visa extensions by dint of funds on account in a Thai bank. All of the above developments would indicate that immigration matters in both countries will continue to be complex if not downright difficult in the coming year and beyond. U.S. Immigration and Customs Enforcement was?ordered to quadruple worksite enforcement this year, and it did just that. In fiscal year 2018, which ended Sept. 30, ICE set 10-year highs for the number of worksite audits conducted (5,981) and criminal charges filed (779). ICE leadership claimed its?crackdown is focused on employers and employees equally as part of a balanced approach to worksite enforcement,?but the data show?that the majority of arrests in 2018 were of workers. The 113 members of management?charged with criminal violations in 2018 increased 82 percent from the previous year, but the 666 workers charged with criminal violations increased by 812 percent. The number of “administrative arrests” –?those for basic immigration violations that are predominantly used against workers – spiked from 172 in 2017 to 1,525 in 2018. The 121 federal indictments and convictions of managers in 2018 represented a 10-year low for the agency. It appears officials in the United States are predominantly concerned with immigration violations in an employment context, but there have also been developments which show the administration’s determination to more zealously scrutinize proposed beneficiary’s of immigration benefits as evidenced by the creation of the National Vetting Center as well as the formation of a task force designed to de-naturalize those suspected of immigration fraud. All of these developments in the aggregate provide substantial evidence that American officials are keen to suppress illegality in the Immigration apparatus. Police, in the ongoing crackdown on foreigners living unlawfully in the Kingdom, have arrested 10 Indian men and 24 Thai women os suspicion of involvement in a scam whereby fake marriages and false documents were used to extend the men’s stay in Thailand…Immigration Police Bureau 1 in Bangkok had detected the fake marriages between the 30 men and 30 women, which were falsely documented in order to extend spousal visas for the men, most of whom made a living in Thailand as illegal moneylenders or salesmen for pay-by-installment goods such as clothing and electrical appliances, police explained. These recent developments evidence both an increased interest on the part of immigration officials to ascertain whether marriages are being entered into for legitimate purposes as well as an increasing level of sophistication utilized by Thai law enforcement officials in targeting suspected visa violators. As of the time of this writing, it does not appear as though the pressure on illegal immigration operators in Thailand and the USA will let up. As of January 1, 2019, the U.S. Embassy in Bangkok and the U.S. Consulate General in Chiang Mai will cease to provide the income affidavit for the purpose of applying for Thai retirement and family visas and will not notarize previous versions of the income affidavit.? ?The Royal Thai Government requires actual verification of income to certify visa applicants meet financial requirements for long-stay visas.? ?The U.S. government cannot provide this verification and will no longer issue the affidavits. Those unaware of the importance of these documents should take note of the fact that in the past notarized income affidavits were used in connection with applications for either a Thai retirement visa or a Thai marriage visa. Such documents were utilized in lieu of presenting evidence of a lump sum in a Thai bank account (800,000 THB for a retirement visa, and 400,000 THB for a marriage visa) or proof of a prolonged history of income in a Thai bank account (65,000 THB per month for a retirement visa and 40,000 per month for a marriage visa). These documents were generally issued by the American Citizen Services (ACS) Section of the US Embassy. 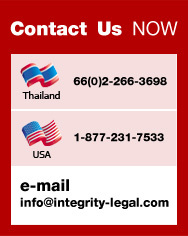 In the past, a notarized income affidavit from the US Embassy which was legalized by the Ministry of Foreign Affairs was sufficient to meet the evidentiary requirements of the Thai Immigration officers adjudicating financial documentation in connection with applications for visa extensions. As seems to be the case in matters pertaining to British income letters, American officials appear to be unwilling to continue issuance these instruments in light of the recent official Thai requests that the veracity of the information in the affidavit be verified rather than merely the authenticity of the signature on the document. It seems that although the Embassy is unable to continue issuing such documentation as it was issued in the past, they will continue to notarize other documentation. Even less-than-avid readers of news regarding Thai Immigration matters are probably aware that there have been a number of changes which have occurred within the ranks of the Immigration Bureau in Thailand (including the appointment of Surachate Hakparn also known as “Big Joke” as head of Immigration). Also, there have been a number of incidents which point to an overall shift in the paradigm of Immigration officers in the Kingdom of Thailand. For example, the ongoing raids occurring throughout Thailand under the Operation X-Ray Outlaw Foreigner program and the follow-on arrests, deportations, and blacklisting associated therewith. Meanwhile, Immigration Checkpoints at various ports of entry throughout the country have seen multiple postings of signs explaining that there is to be “No Tipping” of Immigration personnel by those entering the Kingdom from abroad. The initiative appears to be especially aimed at those arriving in Thailand in need of a Visa on Arrival. This news came upon the heels of reports that individuals were recently arrested in connection with an immigration matter as it was found that the individuals in question were apparently attempting to use forged documents in order to obtain a Thai visa extension. The upshot of these arrests has resulted in increased scrutiny of those filing applications for Thai visa extension. As of the time of this writing, the heightened scrutiny of extension applications appears to be being applied across the board and not exclusively to cases which may be deemed suspicious. This is resulting in delays and difficulties for many people seeking to extend their non-immigrant visa status in the Kingdom. The defence minister has ordered the IB to strictly enforce the law against foreign nationals overstaying their visas and those who remain in the country despite their visas having been revoked…Lt Gen Kongcheep added the foreign nationals identity database has to be integrated with the immigration screening facilities at border checkpoints and airports to help identify more quickly those who?might pose as a threat to national security. ?Meanwhile, Pol Maj Gen Surachate announced IB will begin to deport visa overstayers — of which there are at least 40,000 — within a month. These developments would represent substantial changes in terms of the way Immigration authorities currently enforce the law. Moreover, it is notable that the Immigration database will soon be linked to a more broad identity database which will likely result in better coordination between different government ministries in Thailand. As a result, Immigration authorities will be better equipped to identify and possibly forestall those deemed to be undesirable from entering or reentering the Kingdom. If there are actually 40,000 individuals currently overstaying their status in Thailand it seems logical to infer that the implementation of these measures along with those previously implemented will result in a large number of such individuals being apprehended and possibly deported from Thailand. It should be noted that those arrested in Thailand for visa overstay are likely to be placed on the Blacklist and precluded from returning to the Kingdom for a prolonged period of time. For example, in K-1 visa petitions it is now more likely that more denials will be issued in the future in such cases where it has not been incontrovertibly proven that the couple has in fact met in person within 2 years of filing for the benefit (the so-called Meeting Requirement). Furthermore, in cases involving petitioning for a fiance visa it seems logical to infer that future adjudications may result in a? denial where the petitioner has failed to demonstrate that both parties maintain the requisite intention to marry in the USA. It is difficult to speculate at this time exactly how this change in policy will be implemented and the full consequences associated therewith. However, two things are clear: 1) visa petitions are likely to be more susceptible to denial moving forward and 2) those thinking of undertaking a do-it-yourself approach to petitioning for a fiancee or สูตรยิงปลาmarriage visa are well advised to seriously consider the negative aspects of failing to seek professional legal assistance in immigration matters as failure to fully delineate a case clearly and concisely in the initial petition for immigration benefits could result in a denial and thereby a loss of time and resources. The first team led by Piya Watnawarangul (special agent investigating civil embezzlement) searched the premises of the Office’s Phuket Branch located at 393/4-5 Moo 1 Soi Bantao 1 Srisuntorn Rd., Chengtalay Subdistrict Thalang District, Phuket.? The premises appeared to be the work place of the Thai Nominees and a suspected location for falsifying documents for the purpose of camouflaging nominee activities. The second team led by Worapoj Maihom, searched the premises of the Office’s accounting branch located at 123/9 Moo 5 Chengtalay Subdistrict Thlang District, Phuket.? The office appeared to provide accounting services for the Nominee companies. The third team led by Jakrapop Klinhom searched the premises of the firm’s Samui branch office located at 17/10 Moo 1 Taweeratpakdee Borpud Sub district, Koh Samu District, Suratthani .? The premises were apparently the work place of the Thai Nominees and a suspected location for falsifying documents for the purpose of camouflaging nominee activities. The investigation has found that the group has used Thai employees to incorporate Thai companies.? These Thai Corporate Entities in turn are used to hold shares in other companies for the purpose of allowing foreign investors to buy land.? These activities are in violation of the foreign business act (1999).? Using Nominees to hold land on behalf of foreign persons or entities has a negative impact on national interests and the real estate industry.? DSI will continue to actively pursue and shutdown such activities.